I have been tagged. It's short so play along on your own blog if you would like. 1. What is your favorite Christmas tradition? I would have to say our family Christmas party. It is the time of the year that I get to see the largest number of family members at one time. We always have Mexican food and sometimes we get to play games--A & R are coming in from New York, so maybe I'll have a few willing participants this year in the game area!!! 2. What is your favorite religious themed Christmas Song? Once in Royal David's City--however, it is the least sung song in my meetings. At work I heard a new song (at least to me) written by one of the members of the board of education and I love it too. It is called Christmas Star. 3. What is your favorite Christmas memory from childhood? I remember sleeping in one room with my other siblings. We could hardly get to sleep because we were so excited. We would promise that whoever woke first would wake all the rest. My brother made this tradition the best as we got older. He would put Christmas lights in his room and pack a cooler full of goodies. We would watch tv and snack with Christmas lights glowing all around us until we finally fell asleep. Since we were so excited for Christmas morning we were usually ready for bed the minute it got dark--yes, you have calculated correctly--it is winter so we were ready for bed around 6 or 7. I guess you could say he REALLY helped the time to pass. I have also been working on a few cards. I love the small 3 x 3 sized cards. I decided this year I would make a few to use for Christmas gift thank you cards. However, I wanted them to be something I could use all winter if I don't use them up at Christmas time. Love your traditions and your card are absolutely darling as usual! Merry Christmas! Helleewww! We are always up for GAMES!! Bring all of them along, can't wait to play! We are so excited to be at the family Christmas party this year! Its been so long! 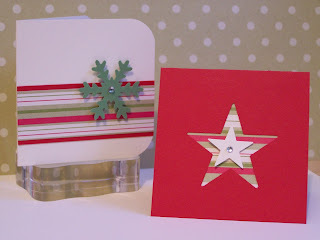 Fun tag and cute cards...as always!